Lithium is a coveted commodity. Lithium-ion batteries store energy that powers mobile phones, electric cars and electricity grids (when attached to wind turbines and photovoltaic cells). Joe Lowry, an expert on the lightest metal, expects demand to nearly triple by 2025. Supply is lagging, which has pushed up the price. Annual contract prices for lithium carbonate and lithium hydroxide doubled in 2017, according to Industrial Minerals, a journal. That is attracting investors to the “lithium triangle” that overlays Argentina, Bolivia and Chile (see map). The region holds 54% of the world’s “lithium resources”, an initial indication of potential supply before assessing proven reserves. The three countries have not been equally eager to seize the opportunity. Market-friendly Chile has a big head start. Argentina is hastening to make up lost ground, as the activity on the Olaroz salt flat suggests. Bolivia, whose resources are as large as Argentina’s, has barely begun to exploit them. Those differences suggest much about how the South American trio treat enterprise and investment more generally. They face a formidable challenger in Australia, where lithium must be expensively crushed out of rock and shipped to China for processing, but investment conditions are friendlier. Chile dominated the world lithium markets for decades. The Atacama salt flat has the largest and highest-quality proven reserves. The desert’s blazing sun, scarce rainfall and mineral-rich brines make Chile’s production costs the world’s lowest. Allied to this is the region’s most benign investment climate. Chile is far ahead in rankings of ease of doing business, levels of corruption, and the quality of its bureaucracy and courts (see charts). Its lithium deposits are close to Antofagasta and other Chilean ports; the lithium carbonate that is produced in Jujuy passes through them. But growth has flattened, allowing Australia to threaten Chile’s position as the world’s top producer. This is mainly because, when it comes to lithium, Chile is less liberal than it is with respect to copper, the country’s biggest export. Fortunately, that problem can be easily fixed. Laws enacted in the 1970s and 1980s classify lithium as a “strategic” material on the ground that it can be used in future nuclear-fusion power plants. There is little prospect that Chile will soon build one of these, but controls on lithium production remain as a way of protecting the desert’s fragile ecosystem. Just two companies, Chile’s SQM and Albemarle of the United States, are allowed to extract brine under leases that were signed in the 1980s. In addition, they are subject to quotas on the lithium they can produce from the brine, which also yields other minerals. The government wants to raise production. But the Economic Development Agency (Corfo), which holds the lithium reserves, is now engaged in a legal dispute with SQM, and so has refused to raise its quotas, which the company is likely to use up by 2021. Chile is looking for other ways to increase output. 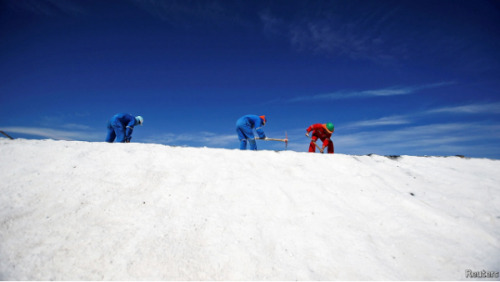 In January Codelco, the state-owned copper company, invited private firms to invest in the Pedernales and Maricunga salt flats, lithium-rich areas that it controls. This year Corfo struck a new deal with Albemarle, which extends its mining lease to 2044 and gives it an additional quota. Albemarle agreed to sell a quarter of its output at preferential prices to Chile-based firms that propose to make value-added products, starting with cathodes for batteries. With higher quotas, the Atacama salt flat alone could more than quadruple production to 350,000 tonnes a year without extracting more brine, says Eduardo Bitran, Corfo’s chief executive. That would help secure Chile’s spot at the top of the global lithium league table. Ending the metal’s strategic status and getting rid of quotas would make still more sense. So would improving Chile’s institutions and infrastructure. Although they are the region’s best, they lag behind those of Australia. “Chile is going in the right direction, but more is needed,” says Daniela Desormeaux of signumBOX, a market-research company based in Santiago. For SQM, this progress is still too slow. It has turned to Argentina. That would not have happened two years ago. It has been decades since anyone thought of Argentina as business-friendly. Cristina Fernández de Kirchner, a populist who governed until December 2015, made things harder. Currency controls to prop up the peso stopped foreign companies from repatriating dividends. Export taxes reduced profits and import controls made it hard to bring in machinery. Investors had to apply to the tax authority for permission to import, and then to the central bank for hard currency, which dwindled as Ms Fernández’s administration wore on. “It would usually take months to get drilling equipment and pumps into the country,” says David Sidoo, chief executive of Advantage Lithium, a Canadian firm. Under the constitution, provinces, not the federal government, own the country’s minerals. Mining firms had to find their way through a confusion of provincial rules and regulations. “It was like the Tower of Babel,” says Daniel Meilán, the country’s current mining secretary. Investors found it difficult to work out which companies had already been awarded concessions, while provincial governments often muscled their way into projects. JEMSE, a mining firm owned by the province of Jujuy, demanded an equity stake of 20% in Sales de Jujuy before settling for 8.5%, financed with a loan from the company. Argentina’s newish president, Mauricio Macri, has tried to unblock investment, including that in lithium. In his first week in office the former businessman eased currency controls and started to scrap export taxes. His entrepreneurial zeal has influenced provincial governments, which are approving permits for exploration and extraction much more quickly. “It’s much faster to get equipment into the country now,” says Mr Sidoo. Jujuy’s government has created a database to make it easier for investors to figure out who holds mining concessions. The federal government is trying to harmonise provincial regulations. It has hammered out agreement on a standard royalty (3% of revenue, plus 1.5% to improve local infrastructure), which must now pass through provincial and federal legislatures. Mr Macri has ambitious plans to improve the country’s lousy infrastructure, although that will take more time. The 16th-century escutcheon of Potosí, a city on the high Andean plain in southern Bolivia, declared it the “treasure of the world, king of all mountains and envy of kings”. Its silver mines bankrolled Spain’s empire. Today’s prospectors are eager to exploit the area’s lithium deposits, but Bolivia’s democratic government is less welcoming than the imperial one. The country’s investment regime suffers from “lack of legal security, weak rule of law, corruption and murky international arbitration measures”, according to the American State Department. Under the left-wing government led by President Evo Morales since 2006, Bolivia has pulled out of numerous bilateral investment treaties, denying investors access to international arbitration. His government has nationalised parts of the oil and gas industries, along with the biggest telecoms company and most of the electricity sector. The government keeps an even tighter grip on lithium than it does on gas, its biggest export. YPFB, the state-owned natural-gas company, at least enters into joint ventures with private-sector firms. Since 2010 the right to extract lithium brine has been reserved for the state. Private firms can now do no more than gaze longingly upon the Uyuni salt flat near Potosí, the largest in the world. The state’s foray into lithium extraction is not going well. It has not yet calculated how Uyuni’s resources translate into exploitable reserves, which normally happens before anyone sinks a well. Even so, it has built a pilot extraction operation and is pressing ahead with plans to construct a full-scale lithium-carbonate plant capable of producing 30,000 tonnes a year. The venture is behind schedule, well over budget and hobbled by a lack of expertise and technology, says Juan Carlos Zuleta, an economist who specialises in lithium. Like Chile, Bolivia hopes to form partnerships with private firms to make value-added products, including batteries and electric cars, through a new lithium enterprise, Yacimientos de Litio Bolivianos. But the government’s insistence on keeping a controlling stake is discouraging potential investors. In 2016 Bolivia sold 25 tonnes of lithium carbonate to China, pocketing a princely $208,000. The government’s attitude towards private investment may be softening. A mining law enacted in 2014 permits new contracts between private firms and the state (though not in lithium). An investment law, passed in the same year, sets out a framework for bringing foreign investors into the country. Another recent measure lays down rules for arbitrating disputes between foreign investors and the state, which could lessen the uncertainty caused by Bolivia’s withdrawal from bilateral treaties. Together, these have piqued investors’ interest, says Fernando Aguirre, a lawyer. Bolivia has a long way to go before it challenges Chile and Argentina for lithium-triangle supremacy. If it continues to open up, Potosí could someday return to glory.